Tonight (or this morning if you are in the northern hemisphere) is the #educoachOC monthly chat. We’re talking diffefentiating coaching. I’m really interested in what the global edu-coaching community has to say about how we might tailor coaching to address a variety of coachee needs and contexts. 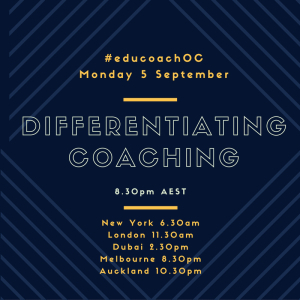 This Monday, on 5 September, our monthly #educoachOC chat will be exploring the topic of differentiating coaching. If coaching is viewed as a catalyst and support for professional growth, then the process should be able to be applied to any individual’s contexts and priorities. Often we see coaching as a model differentiated by its open processes and intent to focus on the individual being coached. But does any coaching process, framework or approach fit most individuals and their growth needs? In education, coaches are involved in coaching people at a variety of places in their careers and personal lives. People come into a coaching conversation with different priorities, different starting points and different needs. Early career teachers. Mid-career teachers. Veteran teachers. Highly reflective practitioners. Less reflective practitioners. Those struggling with change processes, work contexts or personal events. Aspiring leaders. New leaders. Middle leaders. Executive leaders.